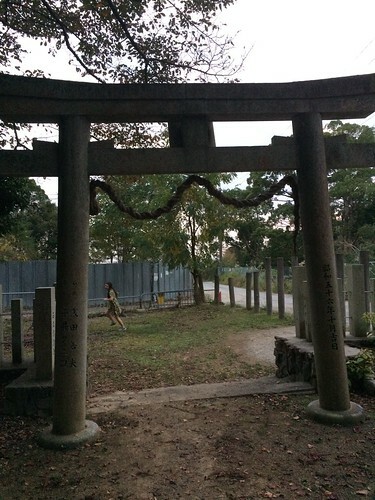 The torii of a shinto temple near our house – looking outwards. This is my first time living in a non Christian culture. I am curious to learn more about the religion of Japan, which is mostly Buddhist mixed with elements of Shinto. I see many temples around here and want to understand them. I started reading on the subject and during my stay here, I am sure I will learn more. Note that I am not religious and being raised Catholic, I am now a secular humanist. I don’t believe in the supernatural, although I want to, and I am undertaking this study from intellectual curiosity, not a search for the meaning of life or other higher calling. I do think that religions are full of wisdom and my life can benefit from their teachings. I started with Shinto because it would be like if Europeans still practiced pagan rituals. In a way they do I guess, because Christianity did incorporate some pre-Christian festivals like the winter solstice become Christmas, but most of beliefs have been lost to time and the power of Christianity. Shinto not so and it is the original religion of the first settlers of the island. It gives a window into what they thought was important and how they answered those big questions of why are we here and what happens to me when I die. The central focus of Shinto is the kami or spirits. The kami can be of ancestors, great historical figures, or of natural phenomena like the sun, trees, wind, etc. Shinto started as honoring ancestors and family lineages, but as the population grew and time went on, the kami became more general. I think that is one way the early Japanese found immortality, by keeping the memory of their forebears alive. Besides the kami, the religion centers on rituals performed at shrines. There is no sacred scripture or teachings, no belief in a god or heaven. It has been passed down through the generations by repeating of group ceremonies or personal rituals. I enjoy going to the shrines, mostly because they are always surrounded by trees, plants, and peaceful surroundings. This is much like the monasteries of Serbia, they were placed in wilderness, away from attack from the Turks. Visiting them usually involves a hike in the surround hillsides and forests. Shinto shrines are surrounded by not so much forests because Japan is a crowded island, but they all have at least a small grove of trees. You can see it very easily in any view of Osaka from above. Where there are a bunch of trees, there is usually a shrine or temple in the center. Nature not only gives the worshipper peaceful surroundings, but also the kami are found in nature. That might be the thing I like best about Shinto, the reverence for big trees. I respect and cherish old trees. All shrines have a gate, called a torii. This helps people move from their busy, daily lives to a peaceful spiritual time. 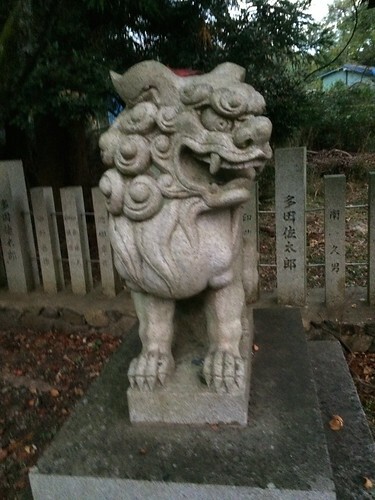 The gates are guarded by fierce looking statues of dogs or lions. These ward off evil spirits and the bad things that plague humanity. There is usually a water fountain to ceremonially wash away pollution and negative spirits. It also involves a walk to a temple that holds a sacred object that symbolizes that particular kami, whether it be a former emperor, war hero, or the spirits from that local area. People leave offerings at the shrines. I don’t think foreigners can become Shintoists. It is a religion that is really tied to the DNA and culture of Japan. During the Meiji Restoration through to World War II, the Japanese government tried to make Shinto the official religion and rid it of Buddhism. They were unsuccessful and today, Shinto is practiced by regular citizens. They form neighborhood networks to take care of shrines and some even become priests for the shrines. Last week I watched a Shinto procession through our neighborhood here in Onohara (neighborhood of Minoh) consisting of a palanquin being carried by men in costumes. Inside the palanquin were drum players and it was followed by about 100 people in colorful robes. I have a lot to learn, but hopefully I have given my readers an introduction to Shinto and one outsider’s cursory view of it. I hope to understand Japan better through a better understanding of Shinto and Buddhism.